23 Jan Childrens' Camera Courses! 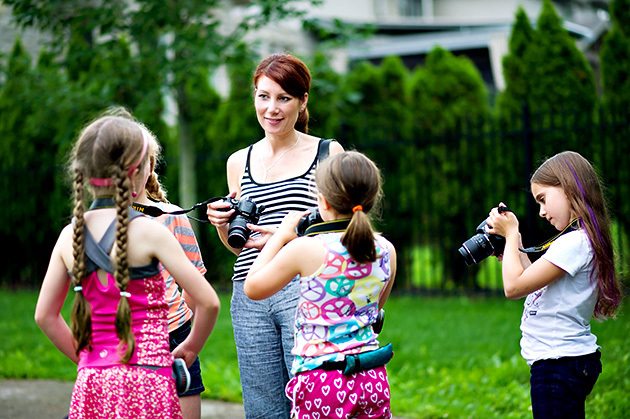 “Do you know anyone teaching photography courses for kids?” It only took one email from a client to start my mind racing. A search in my area did not provide much choice. This got me thinking very seriously about starting courses of my own for children. In the months previous I had been speaking in local high schools to students about careers in photography and business. I loved every moment of these talks so I thought why not make something more formal for children? Within a few short months, my love of children, my passion for photography, and my desire to teach came together. After many hours of piecing together a four hour course for kids aged 8 to 15, and with the generous support of Nikon Pro Services in Canada, “Through Your Eyes…Camera Courses for Kids” was announced. To date I have had over 70 children participate. Words truly cannot do justice to what this experience has taught me as a person and as a photographer. The feedback I have received from parents and the children themselves after our time together has been heart warming and extremely rewarding. These children have given me an incredible gift. To see raw passion and a pure eye that has yet to be touched by the influences of the world is refreshing and inspiring. I ask them to chose a favourite photo from the books they have been looking through. They present the photo to the group and describe the elements that draw them to the photo. Elements could include anything from colour, light and expression to the way the photo is composed or how the child relates to what is going on in the picture. We spend the remainder of our classroom time learning about the camera, lens focal length and how to photograph in a manual setting. I give the children small equations with ISO, aperture and shutter speed and I am always amazed how quickly they learn how these principles interact with each other to change an exposure. We then head outside to put into practice what they have learned during our time in the class. I let the children roam freely to photograph what speaks to them. I believe at this age it is so important to simply encourage them to link their heart to their eye, to photograph what they love and how they see the world. I encourage them to have the courage to experiment and to listen to their own voices and to honour their vision. In the final hour, we load up each child’s card and go through their photos one on one with them. This review gives the children a chance to see what they created, to talk about the photos they love most, and discuss what draws them to their favourites. It was during my last class of 2013 that it became most clear what these children have been teaching me along the way too. I was leading the class into a wooded area – a place that I love and know very well. One child asked to go in a different part of the forest. After we returned from the photo walk and were loading her pictures I was in awe of what she had captured. Things I had not seen in that forest before. This was a moment of learning for me; to look down different paths and to find new ways to see things in my own day to day life and work! For the majority of these children, this course is their first exposure to formal photography training. To be given the opportunity to inspire, to encourage and to give to these young lives is something that I cherish. The passion in their eyes and the excitement in their voices tells me they have already begun a life long love for photography. 1) No fancy gear required. Children don’t need anything complicated to start photographing. iPods, iPads, or a simple point and shoot will get them going! 2) Always encourage. Allow them to see the world their way and support the style and voice that belongs to them. The more they listen to themselves the stronger they will be as artists and as human beings. 3) Don’t underestimate how early they can start to grasp photography concepts so introduce the basics when they are young. 4) Live in the moment. As fun as photography is, make sure that kids learn when to put the camera down and just enjoy what is going on around them. 5) Photography is a way to express ones self. Many parents have told me that for their child/teen photography is a way for them to connect to something in their lives. If your child hasn’t quite found their “thing” in a sport or an activity, photography might just be for them. This is great Hillary! Good for you, such a great thing to do.